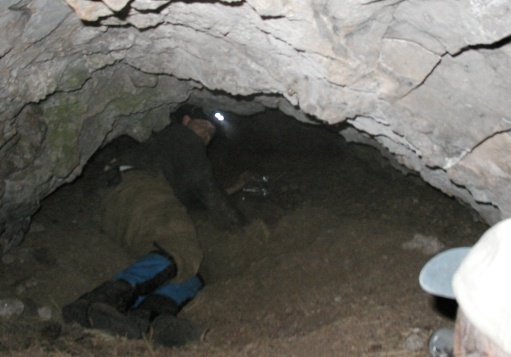 Isaac Bailey (commerical photograher from Phoenix, Arizona) lies on the mass of soft grass bedding in the rear of the cave he discovered during the BFRO's first Arizona Expedition (April, 2006). 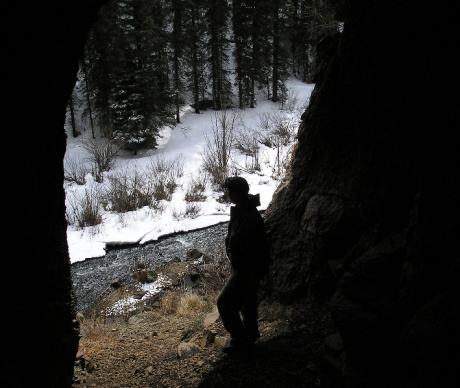 Isaac found the cave below the lip of an 8000 foot plateau, near where a retired Phoenix police officer and his wife reported seeing a sasquatch walking down a mountainside in July 2005. That incident was reported to local rangers immediately after it happened. The rangers investigated the area on the following day, and found, and cast, 20" sasquatch tracks, which they showed to some of the expedition guides. The casts and circumstances were impressive enough for the expedition group to focus on this portion of the Mogollon Rim during the expedition. In the photo Isaac is seen lying on the soft grass bedding that covered the floor of the rear half of the cave. The bedding covered an area the size of 3-4 king size beds. The grassy bedding was soft and comfortable, and was roughly 1 foot deep from wall to wall. This cave is nearly 40 feet deep, 10 feet wide, and 7 feet high at the entrance. It tapers quickly to a height of 4 feet and maintains that height nearly to the back of the cave. This cave was not created by the flow of water, and it is distinctly not a lava tube. Both the floor of this cave and the roof of this cave were noticeably different from other cave/overhang formations in the same strata along the canyon rim. As noted by a geologist attending the expedition, the floors of the other caves/overhangs along the canyon were covered with jagged rocks that had fallen from the ceiling. By striking contrast, in this cave, dirt had been brought in and spread across the floor, filling in the gaps between the jagged rocks, to make the floor flat and easier to crawl across. Some large rocks had been moved to the sides to create a crawl channel for the first 20 feet or so. The ceilings of the other caves/overhangs under this plateau rim showed the flat, natural contours of the rock layers. Whereas, this cave had a gouged, arched ceiling. Most of the protruding pieces of rock had been systematically chipped off the ceiling at some point in the past. The ceiling was not shaped by the forces of erosion. Nor was it created by miners. Shafts created by miners are easy to identify. The rock walls of mines inevitably show markings of the tools used to pick or bore through the rock. The walls of this cave showed no such markings. The rock layer of the plateau was not solid. It was fractured rock that could be chipped away in chunks by pounding against it with another rock. Why go to the trouble of chipping out a cave when other, naturally formed, cave-like overhangs were less than a quarter mile away? Possible answer: Not far from the entrance of the cave there are rock outcroppings that afford a commanding view of the confluence of three canyons used by migrating elk herds. A different cave in the upper portion of the same canyon as Isaac's cave. This other cave was different in several respects from Isaac's cave. - It was clearly formed by natural erosion. - It was more exposed to view from the creek below. - It did not have a commanding view of the confluence of elk canyons. - There was nothing inside to suggest that was used for habitation by anything. This photo taken on the second day of the BFRO's 2006 Arizona expedition by Jerry Hermann (BFRO - Oklahoma). In Isaac Bailey cave there was nothing to suggest human use, ever. There was no writing on the rock walls, no trash, no evidence of fire, either inside or anywhere around the cave. There was no carbon soot on the walls. The total lack of carbon soot indicated that it was probably never used by native Americans. Fire soot on a dry cave ceiling will remain for hundreds of years, if not thousands of years. There were no bones in the cave. A few bags of the grass bedding were removed from the cave and will be examined for hairs by an accomplished paleontologist from north-central New Mexico who attended the expedition. We suspect the cave is used mainly in the warmer months. It was above the snow line in early April. There was no indication of current usage in early April, and it is situated below the lip of a plateau that is frequented by large herds of elk in the summer, when the grass is plentiful. A professional wildlife biologist from northeast Arizona examined the cave. She concurred that the bedding appeared to be prepared by something with hands, and not gathered by any known animal, including bears or wood rats. She elborated on the differences between this accumulation of grass and a wood rat's nest. The cave overlooks a canyon. Across the canyon there is a vantage point that will allow for monitoring of the cave with telephoto lenses in the summer. Those who participated in this expedition are encouraged to coordinate periodic monitoring of this cave, from a safe distance, during the summer. You are invited to attend the upcoming BFRO Expeditions.